Bonne Annee and all that stuff. A bit late, but like a true European, the French still kiss and wish you "Tout Mes Vieux" in February. Just back from 19 days in Cornwall. Yes 19 days, and you were all spread betting that I wouldn`t last 5! As ever, I immediately succumbed to Man Flu the moment that we arrived. It happens every year the moment that I stop working. Freya, too, was ill and even the cat had cystitis. Only Dealer dog survived unscathed. During our stay, I have developed OWBD, a uniquely Cornish disorder. I loathe wheelie bins. Loathe them, loathe them, loathe them, and our beach house has come complete with it`s own welly boot green wheelie, and I hate it. It sits in all it`s smellyness outside the house, ever reproachful. In other parts of lovely St Ives, whole squares of cottages are surrounded by armies of the wretched plastic things, like regiments of Daleks. My aim was to prove to Mrs Swaffer, who for some unaccountable reason has always wanted a bin on wheels, that it is not needed. So each evening, under the cover of darkness, I`ve hauled the days waste, cat litter and household detritus, to any one of a number of larger, public black plastic wheelie bins around the town. Mrs Swaffer says that I`m turning into Mr Trebus, the endearingly barmy recluse who filled his house and garden with plastic bags full of refuse, becoming a reality television series all on his own. But she doesn`t seem to understand that I am Mr Trebus in reverse, and that I simply want to empty the house of refuse, not fill it. 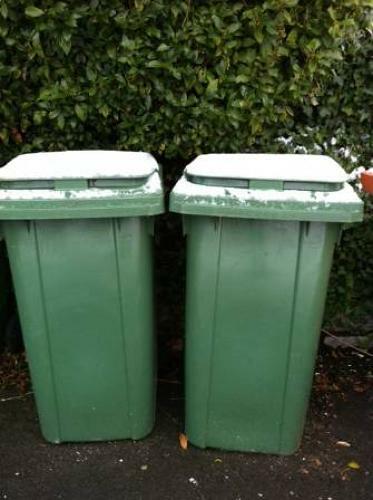 My ultimate would be to dump the wheelie bin in a wheelie bin of it`s own!! Being away for so long has led to a rag bag of memories from 2012. One of the funniest moments being in the lavatories at Montpelier Antiques Fair. Going to the lavatory at a French fair is always a bit of a challenge. Actually, lets face it, going to the lavatory anywhere in France is always a bit of a problem. At the fairs one has to negotiate the unfortunate opportunist who sets up outside the lavatory with a folding formica table piled high with duty free Marlboro full strength, various chewing gums and several bars of melted chocolate. She usually has a mouthful of gold teeth and a begging bowl with one euro scribbled on a bit of bent cardboard. She probably has packs of something for the weekend hidden below the table. It is never an easy thing for two heterosexual men to take a pee together. There is a certain etiquette involved. Instinctively, one always avoids peeing in the urinal next to one`s companion. And so it is that Alan and I, having dodged the one euro blagger, chose stalls numbers two and four of a four urinal line up. Now, there is a certain type of 65 year old Frenchman who likes to dress as a hunter, no matter what the event. Enter, two such men in tweeds, wearing Tyrolean hats encrusted with fishing flies, waistcoats full of helpful little compartments, no doubt full of shotgun cartridges, marlboro cigarettes and gum. So, there we all were, hunters in urinals one and three, uncomfortably close to Alan and I in two and four. All peeing away in silence as men do. From behind a closed door in the sit down stalls, the occupant let out a nuclear fart of epic proportions, followed by a teeny, tiny plop as the result hit the water with a lack of splash worthy of Tom Daly. Hunters one and three, without a word or a sideways glance, broke into a perfect dawn chorus of whistling birdsong. For a full two minutes that dirty old pissoir was filled with the pitch perfect songs of skylarks and song thrushes being lured into gunsights on a Languedoc hillside. So, Tyrolean hats off to the French for the most sophisticated "toilet humour!!"